Distraction arthroplasty of the elbow was initially described by Volkov and Oganesian in 1975 , Their technique was based on some of Ilizarov’s principles of fine-wire external fixation recently popularized in Europe and North America. Deland et al. reported their experience with a hinged external fixation device for the elbow in 1983. Morrey designed a relatively simple hinged external fixation device for distraction arthroplasty of the elbow and has used it since 1986 [3–6]. 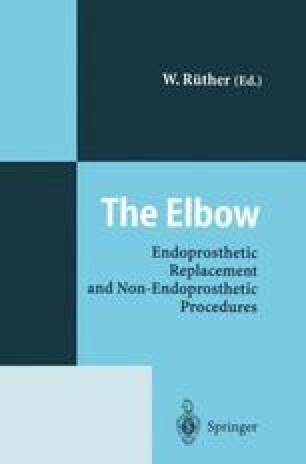 The kinematics of the normal elbow, which behaves as almost a pure hinge joint in flexion/extension, makes the use of a hinged distractor possible [2,7–10]. The loci of instant centers of rotation of the elbow for flexion and extension fall within a circle less than 4 mm in diameter. This allows a simple hinged device to be applied to the elbow and the axis of rotation to be simulated by a pin.